During 2015 we made new investments and commitments amounting to €93m, an increase of 14% compared to the previous year. The main priorities for investments were fund investments and internationalisation of Finland’s venture capital and private equity industry. Exit activity was very brisk in 2015. There were exits with a positive impact on profit both from direct investments and from fund investments. The largest was the conclusion as planned of the ownership arrangements for the Turku shipyard, when Meyer Werft purchased Finnish Industry Investment’s holding from the company in spring 2015. There were also exits from some listed companies. Altogether in 2015 there were eight full exits and five partial exits from portfolio companies. There were also numerous positive exits from Finnish Industry Investment’s portfolio funds, both in Finland and abroad. 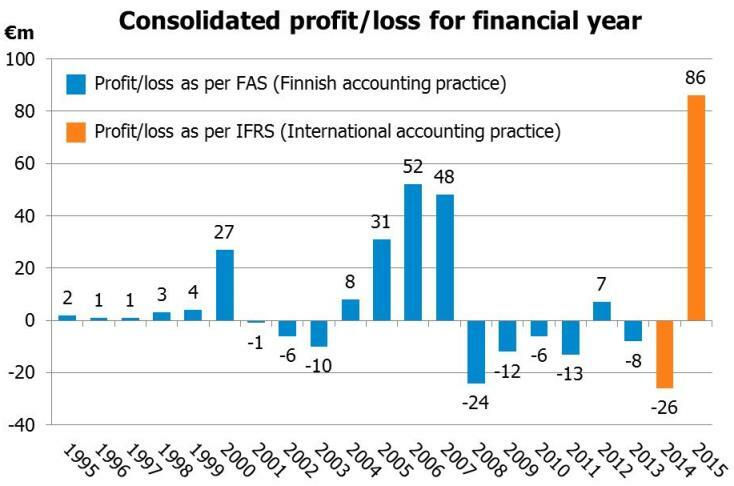 Profit after taxes was €86.4m in 2015 (€-25.7m in 2014). Numerous exits on favourable terms, both from direct investments and from funds’ portfolio companies, combined to produce the best financial result in the company’s history. There were favourable developments also in the valuations of both direct investments and funds in the company’s portfolio. Net returns on private equity and venture capital investments amounted to €108.8m (€-39.7m). We paid out a total €68.3m (€62.8m) in capital calls to our portfolio funds. Correspondingly, the funds returned altogether €99.1m (€60.5m in 2014) from investments. Funds had a positive impact of €71.6m on profit for the financial year. We paid out a total of €24.9m (€39.0m) in direct investments and received some €57.3m (€7.7m) in cash flow from them during the year. Direct investments had a positive impact of €37.2m on profit for the financial year. Our operation over the long term has been profitable. The government has invested a cumulative total of €655m in Finnish Industry Investment. The cumulative profit from the company’s operations amounted to €213m at the end of 2015.